It’s “Die Hard in a missile silo” as U.S. Air Force courier Nick Corrigan (The Dragon) is inadvertently pulled into a hostage scenario. When the “Brethren of the Party of Allah”, a terrorist sect led by Fawkes (Fuller), commandeers said silo and threatens to release the nukes if they don’t receive 100 million dollars in gold, it’s up to Corrigan alone to stop them. Luckily, Corrigan is a former Special Forces soldier. On the outside, General Carmichael (Irwin, in a career-making performance), doesn’t trust Corrigan and wants to launch an air strike on the whole compound. Now in a race against time with not just the baddies, but the Air Force itself, will Corrigan use his wits - and his fighting abilities - to save the world? For a low-budget Corman movie with minimal locations, Bloodfist 6: Ground Zero (again, it probably should have just been called “Ground Zero” as it has no connection to the first two Bloodfist movies), is a reasonably entertaining and fast-paced “Diehardina” movie. We coined another term! It’s no use pointing out ALL the similarities to Die Hard, but it even features a main villain with a sinister accent. Many cliches are out in force: dudes screaming while shooting machine guns, dialogue you’ve heard thousands of times before, including Comeuppance Reviews classic “we’ve got company”, and a multi-ethnic team of evil terrorists. The band of anti-Western Islamic jihadists you could never do today, so it’s always nice to see things you couldn’t get away with in the modern, PC age. Another movie highlight is the great Wynn Irwin as Carmichael. His super-disgruntled attitude and amusing, old-timey racism gives a window as to what it might look like if Archie Bunker commanded the U.S. Air Force. For a man with the word (or at least the sound) “win” in his name TWICE, he really...well...gives a winning performance. Irwin actually appeared in Die Hard 2, so perhaps this all felt a little...familiar...to him. Or maybe that’s why he was originally cast, to give the proceedings as much of a “Die Hard”-y feel as possible. Nevertheless, the man’s clearly a national treasure. Back to the baddies, familiar faces Art Camacho and Michael Blanks are on board, and the aforementioned Fuller looks like a cross between Steve Buscemi and Willem Dafoe, enhancing his evilness. One of the other antagonists has a hat that we think was Richard Roundtree’s hat from Bloodfist 3 (1992) Because, for whatever reason, the team of bad guys must resemble a Benetton ad, they included a man of Asian descent - but they picked one that happens to resemble Don “The Dragon” Wilson. We dubbed him Ron “The Wagon” Bilson. Maybe in bizarro world, he could be Out For Blood's(1992) infamous “Karate Man”. We may never know. Additionally, we have Cat Sassoon from Bloodfist 4 (1992) - where do her allegiances lie? Director Rick Jacobson has worked with Don The Dragon a lot in his career, so surely he knows that his shirtlessness was integral to the plot. But there are a lot of (probably) unintentionally silly fight scenes, and Wilson’s moves are as good as always, but they’re not put to their best use here. This movie as a whole probably exclusively appealed to Don The Dragon’s fanbase back in the video store days. It’s hard to imagine a layperson deciding to rent Bloodfist 6: Ground Zero at their local video store when there are so many other options available. But now, thanks to DVD, action fans can make up their own mind. This movie most likely isn’t the best use of The Dragon’s talents, but he gives his all and his personality raises the level of the movie, which is okay, no more no less. Bloodfist 6 is decent, thanks to The Dragon, but not really a rousing success. This was one of my favorite entries in the series, BTW you forget to mention Cat Sassoon. Whoops our mistake, we will put her in the cast list. She had a nice role in this. 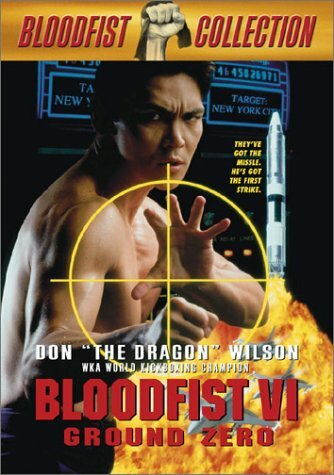 I've only seen the first 4 Bloodfist films - the others haven't been released in the UK and I'm not sure I can justify importing such ropey DTV flicks. Still this one sounds pretty good. I can always go for a good 'Diehardina' movie (nice phrase). Thanks! This was pretty enjoyable...that's interesting that the other sequels haven't been released in the U.K...they have been out for a long time. Probably not worth buying though...haha. I always remember this one because of the scene with the bunny in the beginning that establishes Wilson as a good guy. We don't remember that part right now. You have a good memory. Don "The Bunny" Wilson.